Introduction : After constructing the orthocenter H of triangle ABC, let's check the relationships between any vertex of the triangle ABC and the orthocenter H and between any other special points and orthocenter H.
If any vertex of the triangle ABC is moved to where the orthocenter H is located, H is located at the location of the vertex. 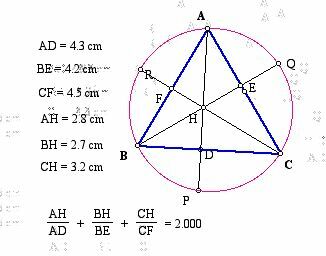 The vertex of each triangle HAB, HBC, and HAC is C, A, and B respectively. Click HERE for a GSP file with "move" buttons to see these animations. 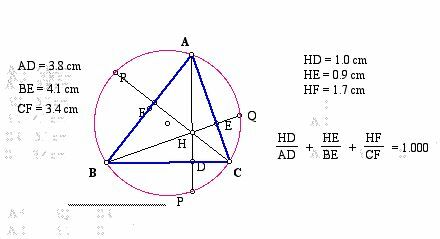 Orthocenter H and intersections with the three altitudes. 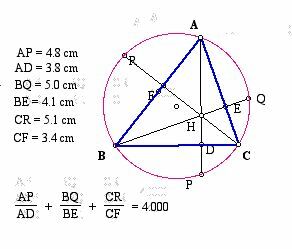 After constructing any acute triangle ABC and it's circumcircle, let's consider the three altitudes AD, BE, and CF. Extend each altitude to its intersection with the circumcenter at corresponding points P, Q, and R.
Click HERE for a GSP sketch. 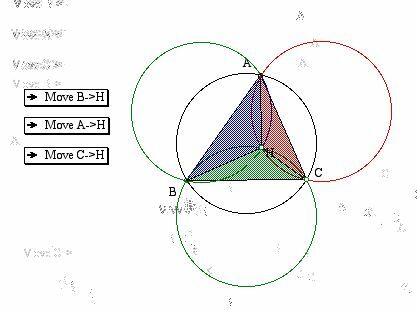 Proof: The area of triangle ABC equals 1/2 * AD * BC = 1/2 * BE * AC = 1/2 * AB * CF ....... (1). we can get the equation 1/2 * AD * BC = 1/2 * ( HD * BC + HE * AC + HF * AB ). we can get 1 = HD/ AD + ( HE * AC) / ( AD * BC ) + (HF * AB) / ( AD * BC ). 1 = HD / AD + HE / BE + HF / CF. Proof: From the equation 1 = HD / AD + HE / BE + HF / CF. = 1 + 1 + 1 - ( HD / AD + HE / BE + HF / CF ). = AD / AD + BE / BE + CF / CF - ( HD / AD + HE / BE + HF / CF ). = AH / AD + BH / BE + CH / CF. So, we can get the the equation ( AH / AD + BH / BE + CH / CF ) = 2.